54 The Journal of Commerce | July 9 2018 www.joc.com Trading Places Peter Tirschwell HAVING SPENT THE last decade cutting costs to a degree that often disadvantages customers, contain- er carriers have reached a point where they can't slash costs more; even mergers will yield little if any additional value. Thus, carriers have no choice but to begin looking at ways of escaping the vicious cycle of commoditization and finding ways to create value for customers. This is the view of longtime Hapag-Lloyd executive Wolfgang Freese, the Maritime Hall of Fame inductee who retired this spring as president of the carrier's North America region. "The carriers' 'race to scale' over the past 10 years, where we tried to drive down costs, and we have passed along those cost reduc- tions to customers, has now run its course," he told The Journal of Commerce. "The past was all about reducing unit costs, which overrode all other considerations including service quality. What was not seen, because there was no money avail- able to spend, was investments in improving service quality including improvements in customer service. "The priorities have to change and will change," he said. "I believe that the future will be about provid- ing more reliability, consistent and more differentiated." After a historic wave of consoli- dation over the past two years that took out several major brands, a new emboldened carrier industry will emerge. It stands to reason that something fundamental must change in an industry vital to global trade that generates more than $200 billion a year in revenue, yet achieved an average return on invested capital of just 2.6 percent from 1995-2016, according to a recent report on the future of container shipping by consultant McKinsey and cargo insurer TT Club. The report outlined four scenar- ios possible by 2043: The industry gets disrupted by new players able to effectively leverage digital; the industry leverages digitization to reinvent itself; a third wave of globalization in the developed world creates a new source of growth; and finally a "peak container" phe- nomenon occurs where global trade enters a long-term period of decline due to near-shoring, 3D printing, geopolitical tensions, and trade wars that lead to further consolidation among carriers. Fundamental change taking the industry in any of those directions has yet to occur — the recent imposition of emergency bunker surcharges shows how little by way of partnership exists between carriers and customers — but that is not to say change isn't coming. Maersk's attempted reinvention of its business as an integrated carrier in the ocean container space, the CMA CGM purchase of a stake in CEVA Logistics, and other moves suggest carriers are looking beyond their current business models. Freese believes customer service will be where major change will first start to be visible. "Some- thing new is coming. The focus going forward will increasingly be (transitioning) from cost-cutting measures toward creating value for customers, in terms of how carriers can share in the value that is created. Carrier service will improve, as will schedule reliability, and customer service levels." 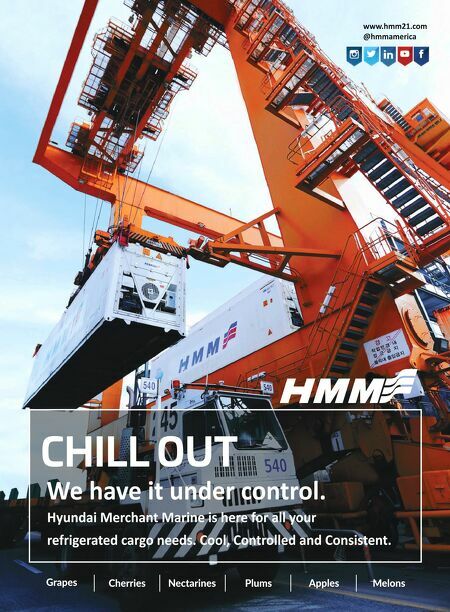 Perhaps hinting at where Hapag-Lloyd may be headed, Freese sees carriers able to do a much better job at what should be the simple task of setting clear customer expecta- tions and delivering against them. "Carriers currently effectively sell on a 'best effort' promise, without being transparent or clear about service levels that customers can expect. When you promise the blue of the sky, customers could rightfully expect as much as possible because of lack of clarity having cre- ated expectation levels that carriers were never able to meet," he said. In his view, "cargo owners want more reliability on on-time delivery, more consistency, and they need clarity about what they are getting and what they are paying for. For example, a customer buys a certain service and asks for fast transit times and on-time delivery on intermodal. The carrier says, 'Yes, we meet the requirements,' (then) they go into the details, looking at port considerations and the current trucker challenge. "You need to be much more precise. You should tell the customer that different ports have different dwell times. It gets down to the details; by going into the details, you don't disappoint your customer be- cause you have discussed it in detail. It has not created an expectation level that you can never fulfill." One school of thought is that carriers will have to demonstrate they can create value for customers as a first step to eventually being compensated for the value they create. That is a key point, suggest- ing that carriers will have to invest significantly in business reinvent- ion on the premise that they can finally — after decades — break the cycle of arm's length, price-based relationships. "The carriers are investing in ships, terminals, and technology so that they can deliver more inte- grated services. When this happens, the discussions with BCOs will move from price to value," said Bob Sappio, former longtime APL executive who is now CEO of SeaCube Container Leasing. 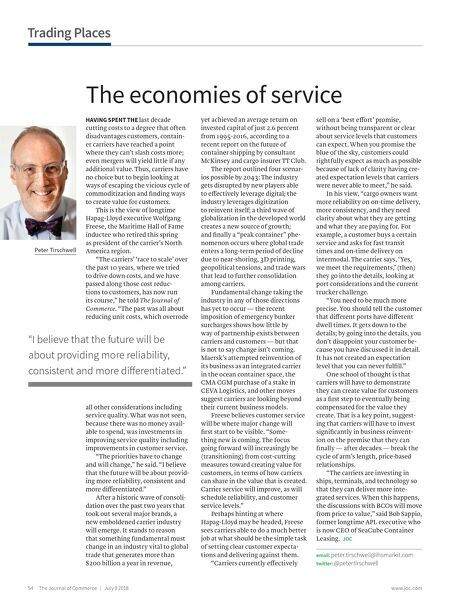 JOC email: peter.tirschwell@ihsmarkit.com twitter: @petertirschwell The economies of service "I believe that the future will be about providing more reliability, consistent and more differentiated."